Summary: Tam and Ned, identical twins, build a raft and launch it on the Great River, heading for the sea. The river is too strong for their flimsy raft and despite their father’s efforts to save them, Tam drowns. Ned survives because his mother, Sister Witch, resorts to a bit of magic, binding Tam’s soul to Ned. Ned lives, but as a slow, shy, silent, awkward boy,” the wrong boy”, the villagers say, a boy without words. Aine is an industrious, resilient, resourceful girl who learns to sail and fish by the sea with her parents. Then her mother dies and her father moves them to the dark wood, finds his magic talisman, and returns to his first life, banditry. Nine stones are in the dark wood, not alive, but not dead, waiting for “the wrong boy.” A kingdom is divided by the dark, wicked wood, and a villain plots to overthrow the good queen of one half the kingdom while Aine’s father, the Bandit King plots to overthrow the other. In the center of these diverse strands of story is the magic, words trapped in a clay pot and left in the care of Sister Witch. She uses it for good, never selfishly (with one small exception). Before these strands are woven into a satisfying completion, Ned speaks and acts with courage; Aine learns to love and trust; the Bandit King makes a sacrifice; the kingdom is reunited; the dark wood becomes a welcoming road; the nine stones move on, taking the magic with them. Did I neglect to mention a wolf, a battle, a rock slide, and a nail biting chase? Literary elements at work in the story: This is fantasy, imaginative, exciting, complex, and rewarding. The author weaves a spell with words; another world springs to life. Her descriptive powers are superb: the burning, bubbling, slithering pot of magic words can almost be felt. The reader is skillfully led with hints, suggestions, changes of voice and site. 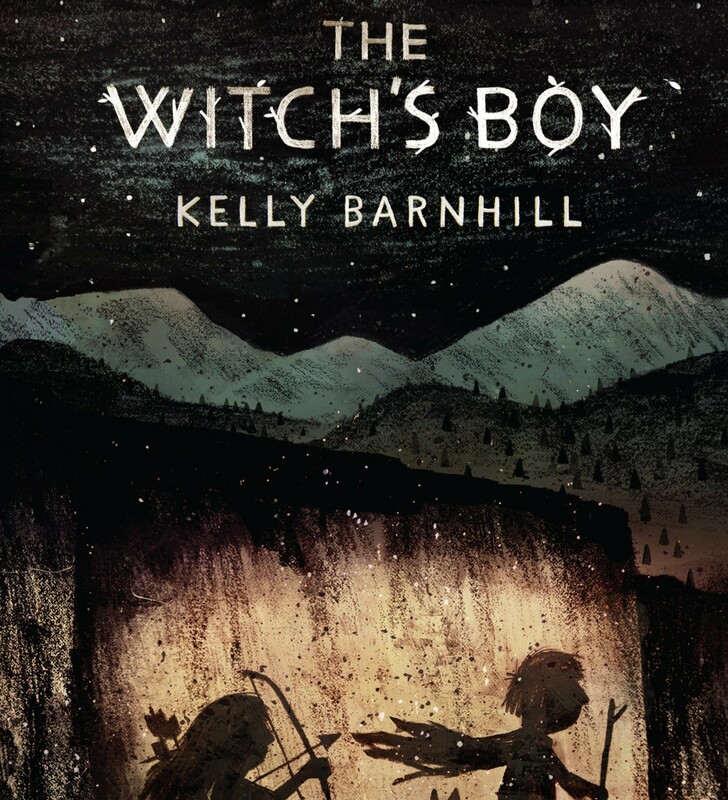 The Witch’s Boy is rich in themes: power, responsibility, love, forgiveness, greed, sacrifice, keeping promises, and growing up. The book has a place on several “best book” lists for 2014. How does the perspective on gender/race/culture/economics/ability make a difference to the story? Aine, the Bandit King’s daughter, is a strong girl, much stronger than Ned when they first meet. Sister Witch is a strong woman of integrity, dedicated to protecting and controlling the magic left in her care. The queen of the small isolated kingdom is wise and good; her male counterpart in the larger kingdom is spoiled and cruel. If there is gender bias in this book it is toward females. The villagers speak often of Ned as “the wrong boy.” What impact does this have on who he is becoming? Aine’s mother says, “The wrong boy will save your life and you will save his.” How did Ned save Aine’s life? What did she need? What were the occasions when the magic was used for an immediate, personal need?? What were the consequences? “A word, after all, is a kind of magic.” What do you think of this statement? Does a pot of moving, burning words make a good symbol for magic? What was the fear that trapped the Stones and made them lose the magic? Have you been tempted to do something wrong? Did you argue with yourself for and against it? Or did someone else argue with you? Do you recognize how the voice of the magic tempts Ned? In the end Ned finds satisfaction in growing strong and helping his father. How does he compare his work and the power of the magic? Jesus promises that when we ask in his name, we will receive. How does this differ from magic? When is it right to use prayer to get something that we want? If you had three wishes…this is a question that is part of fairy tales or games we have played as children. For what three things would you have asked the magic? Can you foresee the consequences of getting your wishes? Can you think of some bad consequences? This review is written by Union Presbyterian Seminary alumna Virginia Thomas. The Witch’s Boy by Storypath is licensed under a Creative Commons Attribution-NonCommercial 4.0 International License.